Shane Clanton earned $10,000 for his victory at Screven. What won the race: Leading all 50 laps, polesitter Shane Clanton of Zebulon, Ga., outran Kyle Hardy of Stephens City, Va., to earn a $10,000 World of Outlaws Morton Buildings Late Model Series victory in Screven Motor Speedway's Winter Freeze IX finale. The victory marks Clanton's first on the national tour since Aug. 26, 2017. On the move: Frank Heckenast Jr. of Frankfort, Ill., started 20th and finished 13th. Winner's sponsors: Clanton’s Capital Race Car is powered by a Clements Racing Engine and sponsored by Weldbank Energy, Advocare, Keyser Mfg., Super K Express, The Butcher Shop, Bill Roberts Trucking, Cooper Meat Packers, Penske Shocks and M&S Concrete. Points chase: After Screven: 1. Shane Clanton (286); 2. Chase Junghans (284); 3. Brian Shirley (282); 4. Brandon Sheppard (280); 5. Darrell Lanigan (278); 6. Chris Madden (278); 7. Brandon Overton (276); 8. Kyle Hardy (274); 9. Ricky Weiss (254); Dennis Erb Jr. (252). SYLVANIA, Ga. (Feb. 9) — Winless on the national tour in 2018, it had been more than a year since Shane Clanton last visited World of Outlaws Morton Buildings Late Model Series victory lane. But the Zebulon, Ga., driver’s 43-race skid finally came to an end on Saturday night with a $10,000 victory in Screven Motor Speedway’s Winter Freeze IX finale. Winning his heat race and redrawing to start on the pole of Saturday’s 50-lap feature, Clanton shot to the lead at the drop of the green flag, catching the tail end of the field on lap eight. Maintaining a comfortable lead as he worked through lapped traffic, the 2015 World of Outlaws champion was never seriously challenged out front, besting rookie contender Kyle Hardy of Stephens City, Va., at the checkers to record his 43rd career Outlaws victory. Hardy finished runner-up, with Chase Junghans of Manhattan, Kan., running third. Rocket Chassis house car driver Brandon Sheppard of New Berlin, Ill., finished third, with reigning Lernerville Speedway track champion Michael Norris of Sarver, Pa., rounding out the top five. Working his way past lapped cars, Hardy was able to close the gap between himself and Clanton just past the halfway mark. But late-race cautions on laps 46 and 48 slowed his momentum. Hardy credited chassis builders Barry and Lance Wright, who assisted him at Screven over the weekend, for Saturday’s strong performance. After finishing 11th in Friday’s show, Hardy sits eighth in the World of Outlaws points standings heading to Volusia Speedway Park, higher than any other Rookie of the Year contender. Posting a top-five finish in Friday’s Winter Freeze opener, Junghans continued his 2019 consistency with a third-place run on Saturday night. While a late-race tangle between Jason Covert of York Haven, Pa., and Cade Dillard of Robeline, La., allowed him to gain a couple of positions at the end, the podium finish still marked another solid run for the Kansas driver. Notes: Clanton’s last World of Outlaws victory came on Aug. 26, 2017, at Merritt Speedway in Lake City, Mich. … Clanton also notched his fourth career series victory at Screven. He won Winter Freeze events in 2016, ’15 and ’13. … The race was slowed by two cautions. … The first yellow flag waved on lap 46 when Ivedent Lloyd Jr. slowed in turn two. … Battling among the top five, Jason Covert and Cade Dillard tangled in turns three and four to draw a caution on lap 48. Row 8: Chub Frank, Dennis Erb Jr.
Row 10: Tyler Carpenter, Frank Heckenast Jr.
Rolling around the top side, outside polesitter Mike Marlar took an early lead, with fellow front-row starter Frank Heckenast Jr. in tow. Marlar began pulling away from Heckenast at the halfway mark, as Tyler Bruening attempted to reel in third-running Billy Moyer. Marlar won the consolation, with Heckenast finishing second. Moyer held off a charging Bruening to finish third. Finish (top three transfer): Mike Marlar, Frank Heckenast Jr., Billy Moyer, Tyler Bruening, Brian Connor, Michael Brown, Steve Casebolt, Scott James, Stacy Boles, Ray Cook, Chuck Hummer. Polesitter Brandon Overton shot to the front of the field at the drop of the green flag, stretching his lead in the early running. A yellow flag waved on lap three when Blake Spencer spun in turn two. Overton pulled away on the restart, with fifth-starting Tyler Carpenter overtaking Boom Briggs for second. Holding more than a straightaway lead, Overton won the consolation, with Carpenter fighting back challenges from Briggs to finish runner-up at the checkered flag. Finish (top three transfer): Brandon Overton, Tyler Carpenter, Boom Briggs, Cla Knight, Brent Larson, Ryan Scott, Blake Spencer, Matt Sponaugle, G.R. Smith, Joe Denby. Scratched: Freddie Carpenter, Jadon Frame. Slipping ahead fo fellow front-row starter Cade Dillard out of turns one and two, Chase Junghans took an early lead. As Mike Marlar attempted to reel in Dennis Erb Jr. for a transfer spot, Junghans stretched his lead over the field at the halfway mark. Junghans won the heat, with Dillard running second. Brent Dixon held off Erb to finish third. Finish (top four transfer): Chase Junghans, Cade Dillard, Brent Dixon, Dennis Erb Jr., Mike Marlar, Brian Connor, Ray Cook, Scott James, Steve Casebolt. Polesitter Kyle Hardy lead the opening lap, with Brian Shirley challenging second-starting Michael Norris for position early. With Hardy holding a comfortable lead out front, Norris continued to hold off a charging Shirley at the halfway mark. Leading all 10 laps, Hardy won the heat, with Norris finishing second and Shirley rounding out the podium. Finish (top four transfer): Kyle Hardy, Michael Norris, Brian Shirley, Ricky Weiss, Frank Heckenast Jr., Billy Moyer, Tyler Bruening, Michael Brown, Stacy Boles, Chuck Hummer. Running side-by-side down the backstretch, polesitter shot ahead of fellow front-row starter Brandon Sheppard out of turns three and four to take an early lead. A yellow flag waved on lap three when Ryan Scott spun in turn three. Clanton maintained his lead on the restart, with Sheppard closing the gap between himself and the race leader on lap seven. With the top two cars pulling away from the field, Clanton won the heat, with Sheppard finishing second. John Henderson ran third, with Chub Frank taking the fourth and final transfer spot. 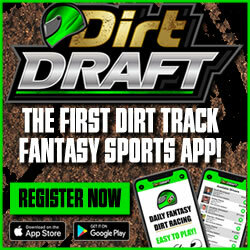 Finish (top four transfer): Shane Clanton, Brandon Sheppard, John Henderson, Chub Frank, Cla Knight, Matt Sponaugle, Brent Larson, Freddie Carpenter, Ryan Scott, Joe Denby. Racing three-wide for the lead into turns one and two, polesitter Jason Covert edged ahead to lead the opening lap, with second-starting Chris Madden slipping back to fourth early. Ivedent Lloyd Jr. overtook Darrell Lanigan for second on the third circuit, with a three-car battle ensuing for the position as Madden joined the hunt. Leading flag-to-flag, Covert won the heat, with Lloyd and Lanigan rounding out the podium. Finish (top four transfer): Jason Covert, Ivedent Lloyd Jr., Darrell Lanigan, Chris Madden, Brandon Overton, Boom Briggs, Tyler Carpenter, G.R. Smith, Blake Spencer. Scratched: Jadon Frame. Row 2: Brent Dixon, Dennis Erb Jr. Though the sun is still shining, Saturday evening’s temperatures are roughly 15 degrees cooler than Friday’s. Lows are predicted to be around the 40-degree mark later tonight. … Departing East Bay Raceway Park in Gibsonton, Fla., father and son duo Freddie and Tyler Carpenter of Parkersburg, Fla., a have joined World of Outlaws competitors at Screven.… Brandon Overton’s Friday night victory should really come as no surprise, with the Evans, Ga., driver winning the last three Super Late Model events he’s entered at the Sylvania, Ga., oval. Located just a little over an hour away from his residence, Screven is one of Overton’s home tracks. … Reigning World of Outlaws champion Mike Marlar of Winfield, Tenn., was experiencing mechanical issues when his Rumley Enterprises machine nearly went spinning during Friday’s feature. “That was making it hard to drive and I was making it wreck,” Marlar said with a laugh. “We’ll get it fixed though.” … After experiencing engines problem on Friday night, Ross Robinson of Georgetown, Del., has scratched from Saturday’s program, along with D.J. Troutman of Hyndman, Pa. … Chase Junghans of Manhattan, Kan., has been one of the most consistent under-the-radar performers so far in 2019. In the 11 events he’s entered, Junghans has finished outside the top 10 just three times. He ran fifth in Friday’s Winter Freeze opener. ... After racing at Screven on Saturday night, Ray Cook of Brasstown, N.C., will make the trip to Tullahoma, Tenn., to deliver a eulogy at the funeral of former crew member Richie Davis, who died Thursday after short battle with cancer. Davis most recently served as a crewman for Clint Bowyer Racing. ... Starting 44 cars, Saturday's 100-lap SCDRA Renegades feature will pay $14,000-to-win. The World of Outlaws Morton Buildings Late Model Series-sanctioned Winter Freeze IX wraps up on Saturday with the second of two $10,000-to-win events at Screven Motor Speedway in Sylvania, Ga.
Brandon Overton of Evans, Ga., led flag-to-flag to win Friday’s World of Outlaws season opener. The victory marked Overton’s third in as many starts at Screven, with all three wins coming behind the wheel of a different race car. The victory was also Overton’s first with his new Rum Runner Racing team. Saturday’s WoO program will include hot laps, time trials, four heat races (top four transfer), two consolations (top three transfer) and the 50-lap main event. Series provisionals will set the final rows of the feature lineup. Watch live video coverage of the action at DirtonDirt.com.